This Swiss Muesli Recipe brings toasted, nutty goodness to breakfast. Serve it with a cup of milk and a hard-boiled egg for a protein rich way to start your day. If you look at breakfast around the world, you see a curious thing. While most Americans are content with their bowl of cereal or bagel, many other countries feature high protein foods prominently in their morning meal. There’s a reason for it. Protein gives you the energy you need to get through your morning. Many experts recommend keeping your body fueled all day long by balancing out your daily protein intake with 25-30 grams of protein at every meal. But, many Americans average around 13 grams of protein in the morning. That’s why Milk Life is taking a stand to inform people of the importance of #MyMorningProtein and the way an 8 oz glass of milk can be the perfect accompaniment to a protein rich breakfast, helping you to reach that protein goal and stay more full and focused well into your morning. So how do we get that much protein? It might seem daunting to reach 25-30 grams of protein before noon, but when you consider that one 8 oz glass of milk contains 8 grams, you’ll see that there are some easy ways to get your morning protein. And, if you look at breakfasts around the world, you’ll see that increasing protein in breakfast is as simple as getting a little global inspiration. Today we’re sharing a traditional Swiss and German breakfast cereal that will get you on your way to that 25-30 gram mark. Muesli (pronounced MEU-zli) is a breakfast dish originates from 1900 in Switzerland, where a physician by the name of Maximilian Bircher-Benner came up with the dish as a remedy for his hospital patients. The original Bircher muesli was soaked overnight in water or juice and eaten in the morning with nuts, fruit, and yogurt. 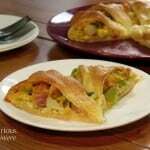 It gained popularity in the Western world as healthy eating trends spread. 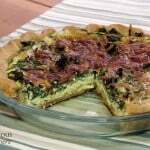 Not just for breakfast, it is commonly eaten in Switzerland and Germany as a light evening meal as well. 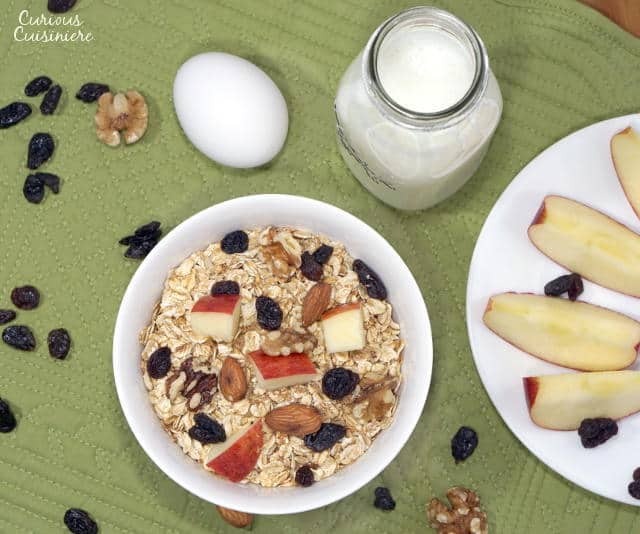 In the States, it is common for muesli to be confused with granola, but there are some key differences between the two. Muesli is unsweetened with a loose texture and no added oil. Granola, on the other hand, is baked dry after adding oil and a sweetener to achieve a crunch, clumpy consistency. While traditional muesli was made with raw oats, we like the warm, nutty flavor that lightly toasting the oats and nuts adds. And, it is easy to toast up a big batch of oats and nuts and store them in your pantry for a quick breakfast. Muesli can be eaten dry with milk or yogurt or it can be soaked overnight for a grab and go breakfast. Either way it is an incredibly flavorful way to get your morning nutrients and a good dose of protein. Oats weigh in at 5 grams of protein per 1/2 c serving. 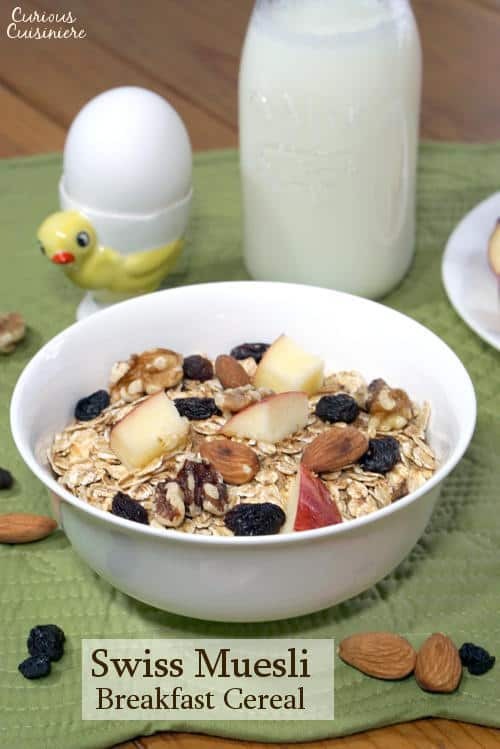 We increased the protein in our muesli by adding wheat germ, which clocks in at 2 grams per tablespoon. Adding the nutty crunch of walnuts (2 g per 1/2 oz) and almonds (3 grams per 1/2 oz) means that a serving of this toasted, nutty cereal gets you up to 12 grams of protein. Adding 8 ounces of milk (8 grams of protein) with your cereal and a hard-boiled eggs (6 grams of protein) puts you at 26 grams total. Which makes this breakfast a great, protein rich, start to your day. So, what are you waiting for? Jump start your mornings with milk and #MyMorningProtein. Leave a comment and tell us, how will you get your 25-30 grams? 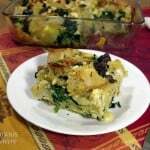 This recipe yields 8 (1/2 c) servings. Prepare the toasted oats and nuts ahead of time and store them in an air-tight container in your pantry for a quick, protein-rich breakfast. Place the oats in a large skillet. Heat over medium heat, stirring often until the oats are fragrant and golden, 4-5 min. Remove the pan from the heat and add the wheat germ and cinnamon. Mix to combine. Remove the oats from the skillet and let cool. Store prepared toasted oat mixture in an airtight container in the pantry until you are ready to make your cereal. Place almonds and walnuts in a large skillet and toast over medium heat, stirring often, until fragrant, 3-4 min. Remove the nuts from the skillet and let cool. Store toasted nuts in an airtight container in the pantry until you are ready to use them. 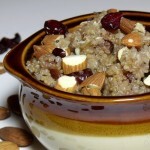 Mix ½ cup of the toasted oats mixture with ¼ cup toasted almonds and walnuts. Add ½ diced apple and 2 Tbsp raisins. Drizzle with honey to sweeten, as desired. Pour milk over the cereal and enjoy. 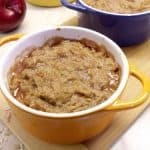 Soak ½ cup of the oat mixture with ½ cup water (juice or milk) and refrigerate 12 hours or overnight. When you are ready to eat, mix in ¼ cup toasted almonds and walnuts, ½ diced apple, and 2 Tbsp raisins. Sweeten as desired with honey. It can be hard to get that protein in the morning. This is a great way to always have something on hand! Greek yogurt with mixed berries is #mymorningprotein. I’m not much of a breakfast person but I do like the granola bars with nuts and they have a big variety to choose from. Those are great for on the go breakfasts. And with the nuts you’re still getting your protein! Yum! Love the added texture too! I start my day with a bowl of old fashioned oatmeal made with milk. I add in cooked quinoa, fruit, nuts, chia seeds, flaxseeds and honey. What a great way to load on the protein! We need to remember that quinoa can be used fro breakfast too! My favorite way to get morning protein is peanut butter on a whole wheat english muffin and 8 oz of skim milk. Gotta love peanut butter for a protein kick! Greek yogurt is my favorite #mymorningprotein! I love muesli, and this looks like such a simple recipe! My favorite protein-rich breakfast is plain Greek yogurt with frozen blueberries, honey, and a sprinkle of granola. Thanks Serena! Your blueberry breakfast parfait sounds wonderful! I love having oatmeal with hemp hearts and blue berries. What a wonderful way to pack the protein into breakfast! We are huge peanut butter fans! Eggs, oatmeal, milk, and some kind of lean meat are my go-to’s for breakfasts! We tend to forget about meats for breakfast, but there are such fun ways to bring them in. Great idea! I like to get my morning protein with overnight oats. I make them with greek yogurt! Great for getting going quick in the morning! Such a great way to get morning protein! #mymorningprotein is 2 hard-boiled egg whites… =) Love it! We do love cottage cheese! I get #mymorningprotein by having a protein shake every morning! A perfect way to get protein! Great-sounding recipe – I’ll have to give it a try. And thanks for explaining the difference between muesli and granola – I had always thought they were just different names for the same thing. Thanks Jason! The differences are slight, but they do make a difference! Such a great way to change up the morning meal! I love eggs and cheese for breakfast! Ooh, we love putting cheese on (or in) our scrambled eggs! #mymorningprotein is a cup of Greek yogurt and peanut butter toast. We love the way peanut butter gets warm and melty on fresh toast! #mymorningprotein Cereal with fruit for me! Great combo! We love bananas or blackberries with our cereal! I eat scrambled eggs most mornings! Such a great way to get a dose of protein in the morning! I get #mymorningprotein from Greek yogurt and granola. That looks delicious! 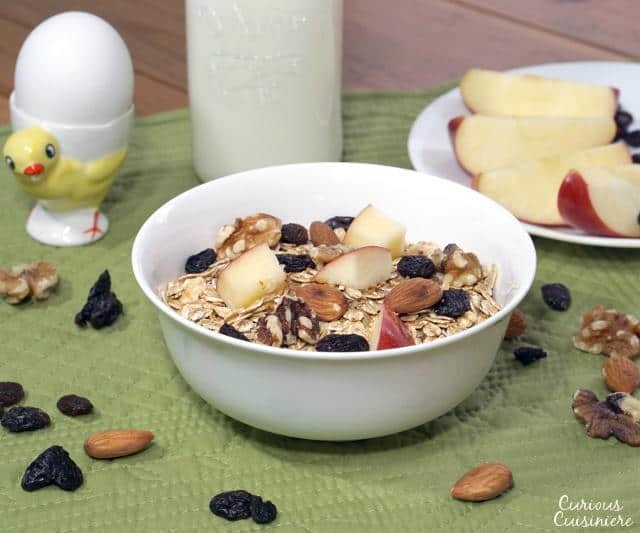 To be honest, I have never tried muesli before- I am trying to get better with eating a good, healthy breakfast because it really seems to determine my day! My favorite way to get #mymorningprotein is with either hard boiled eggs and oatmeal, or bananas with greek yogurt. Yum! Love the added texture (and protein) for a bowl of yogurt! Cottage cheese and avocado is my favorite breakfast proteins! I feel like cottage cheese is a often forgotten breakfast food. But, it’s so tasty! I get my #mymorningprotein with a breakfast of oatmeal or cereal with milk. Scrambled eggs and a bagel! My favorite way to get #mymorningprotein is with yogurt. Love yogurt any time of day, but especially in the morning! So good! We like to throw salsa in our scrambled eggs to give them a little kick! I like to start my day with two egg whites. Eggs are a great warm-you-up breakfast! I get #mymorningprotein in Greek yogurt. Such a great, simple breakfast! 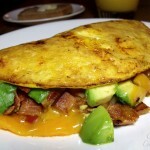 When I have time to whip up a veggie omelet on the weekends, that’s my go-to high protein breakfast. But normally #mymorningprotein comes from overnight oats, prepped with milk and greek yogurt. Delicious! Sounds like you’re a breakfast master! I love to have a few eggs and some peanut butter toast for DOUBLE the protein. Ooh, yes. We love our peanut butter! Gotta love the way a cold glass of milk wakes your body up in the morning! I love adding milk to my granola cereal in the morning. We love the crunch of granola with milk! I like to have a glass of milk with breakfast and also with dinner when we’re having pizza or spaghetti! Great way to get protein through the day! My favorite way to get my #mymorningprotein is by eating eggs for breakfast. I eat eggs almost daily, just to get my day going. They really do help perk you up in the morning! We eat yogurt and fruit every morning, weekends we like smoothies and eggs. Yogurt and fruit is a great combo! I love either Greek yogurt or eggs for a protein filled breakfast. Such great ways to start the day! I like sweet potato hash. I add sweet potatoes, eggs, peppers, onions, sausage, and chia seeds. What a creative breakfast. We love sweet potatoes, so this sounds like a super tasty way to start the day! I have granola cereal with fresh fruit. Granola and milk is a great way to get some morning protein! Such a bright and fresh way to start the day. We like to put yogurt or milk in ours to add a bit of creaminess and protein. Sounds like our typical Saturday breakfast! I like eating eggs for breakfast. Such a great way to get that morning protein! Do you have a favorite way to cook them? I have eggs every morning for breakfast. Eggs are such a great way to start the day! my favorite way to get #mymorningprotein would be omelets, we are blessed to have fresh eggs and I love a warm omelet in the morning. Fresh eggs do make everything taste better! My favorite way to get my morning protein is fried eggs and milk! A fried eggs and toast is such a great way to get going in the morning! Mostly my stomach only handles smoothies in the morning. So we try and do some extra protein into those! We like adding oats to our smoothies and topping them with sliced almonds or pumpkin seeds for a protein boost. What you do you like to add for extra protein? We go through so many bananas, you’d think we had monkeys in the house. Love them! I eat cottage cheese to get #mymorningprotein!! OOh, we always forget about how good cottage cheese is for breakfast! I like to get my morning protein by eating Greek yogurt and eating eggs. It is a great way to start the day! Sounds tasty! 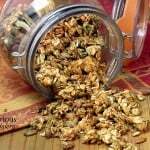 We love homemade granola! I get my protein in the morning through either egg white scrambles or greek yogurt. Scrambles are a fun way to mix up the breakfast routine! I like to have yogurt with almonds. Almonds are a great way to get some added protein! I either eat eggs or fruit and yogurt. I like to get #mymorningprotewin in omelets or yogurt. Yum! Great ways to get protein in the morning! I like egg scrambles with veggies and a little cheese. We love scrambled eggs, there are so many possibilities! My favorite way to get #mymorningprotein is granola with Greek yogurt or Greek Yogurt with some fruit mixed in. Sometimes scrambled eggs, too! Greek Yogurt is a great, protein rich way to start the day!